MIAMI — Goran Dragic has spent nearly one-third of his life in the NBA. The 30-year-old has suited up in both conferences as everything from a spark plug to a centerpiece and has seen all sides of the business of basketball. That's why, as he cools down after his second consecutive 25-point performance, he's not the least bit worried about the trade rumors that refuse to die. "Rumors will always be there," Dragic tells Bleacher Report. "It's not the first time I've been mentioned in them. The only thing that I can control is preparing myself to do my job on the floor and at practice and try to be as solid as possible." 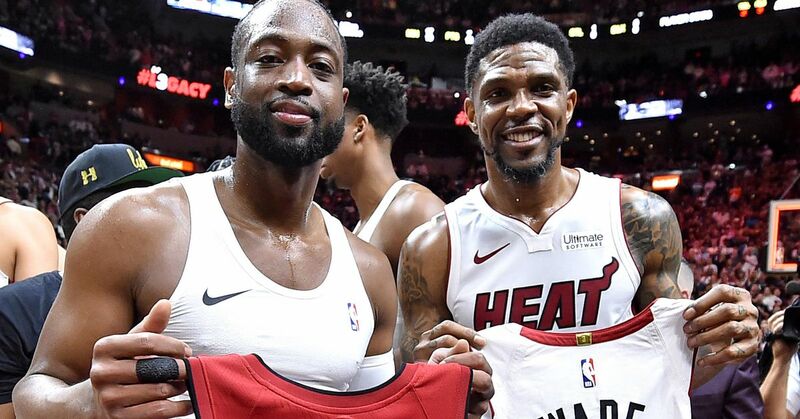 The logic behind the rumors is simple: When the Miami Heat sacrificed two first-round picks to land Dragic at the 2015 trade deadline, the then-All-NBA third-teamer looked like the possible missing piece to reopen a championship window around the Dwyane Wade-Chris Bosh nucleus. Miami doubled down on its commitment to the Dragon with a five-year, $90 million deal that summer. But he's already the last man standing from that trio. Wade went back to his hometown Chicago Bulls in free agency, and Bosh's Heat career has been permanently stalled by blood clots. That leaves Dragic as an aging, expensive player atop a seemingly rebuilding club. Hence, the unending cycle of trade talks. Sources told Basketball Insiders' Michael Scotto that a Dragic deal had been discussed with the Sacramento Kings. That report was shot down twice—directly by head coach Erik Spoelstra to Dragic, per Ira Winderman of the South Florida Sun Sentinel, and by the Miami Herald's Barry Jackson. But that only shifted the conversation. ESPN's Marc Stein reported on a growing sense around the league that Dragic could be moved if the new-look Heat stumbled out of the gate. The trade chatter is unlikely to stop, because the superficial circumstances make Dragic look expendable. But dig deeper into the matter, and that assessment falls apart. For starters, he's a young 30 in NBA terms. He wasn't a full-time starter until his fifth season, so his career minutes average sits at a manageable 26.9 per game. And there's never been a question with durability, as he's missed six games or fewer in five of the last seven seasons (and never more than 12 in that span). He's not cheap, but his $15.8 million salary looks economical in a market that recently deemed Mike Conley worth $153 million for the next five years. Dragic, who's collecting this season's 51st-highest salary, is the only player other than league salary leader LeBron James to average at least 16 points on 48-plus percent shooting and five assists since the start of 2012-13. Plus, Dragic is happy to be with the Heat. He could have soured on the team after the offseason exodus, but instead he has an exhaustive list of what he likes about the franchise. "Everything," he says. "How the organization is doing. They take care of guys. Teammates, of course, the coaching staff, the fans. It's a great spot to be. I'm really comfortable here. I want to stay as long as possible." Equally important, Dragic isn't blocking any of the up-and-comers—which is often the biggest worry with veterans on a prospect-laden team. In fact, his presence is one of the primary developmental tools Miami's youngsters are using. "All of us young guys look up to him," Josh Richardson tells B/R. "Myself, trying to play point guard a little bit, I think he's a great example to look at. In the game, we'll do something, and he'll tell us how to do it better or what else we could've done. Or in film sessions, he'll pull me to the side after like, 'You did this, but you could've done that.'" Dragic has also helped Spoelstra shape an identity for the post-Big Three era. The Heat push whenever possible, a strategy that's yielded the 10th-highest fast-break points average (14.5 per game). The pace slows without Dragic, and the offense crumbles when he sits (from 102.1 points per 100 possessions to 91.0). He's providing late-game stability, pacing the Heat in fourth-quarter points (23) and having yet to commit a turnover in the final period. "I love playing with Goran—his pace, his unselfishness, his aggressiveness on both ends of the floor," Justise Winslow says. "He's great with sharing his ideas, sharing things he sees. He's extremely helpful." Does that mean the Heat should permanently decline trade calls? Of course not. Few players in this league are untouchable, and Dragic is not in that exclusive company. But there's little motivation to move him without getting a Godfather offer. He's molding the next generation of Miami hoopers. He's neither too old to help nor too expensive to restrict movement. It's hard to imagine his trade value shifting dramatically either direction, so there's no reason to rush. Part of the reason he's become a rumor-mill regular is teams value what he brings. That includes the Heat, who view him more as a building block than a liquid asset. "I just know the caliber of player he is," Winslow says. "You ask guys around the league, they have a lot of respect for Goran. We don't get too much into media and fans and what they think—from locker room to locker room, we know the guys that can play and the guys that can't." What could $50 million do for you? For Tyler Johnson, the simple thought of the dollar amount on his new deal made him vomit. The volume of attention his contract has received might be equally dizzying. It's a life-changing pact—one that helped put the 24-year-old in a palatial pad. But inside the lines, $50 million Tyler Johnson is no different than fighting-for-a-roster-spot Tyler Johnson. He's still attacking with reckless abandon, diving after loose balls and flying around the floor with contagious energy. And that surprises no one inside the organization. "His ego is a team ego," Spoelstra says. "He wasn't caught up in any kind of storyline about whether he needed to start, whether he needed to average a certain amount of points. ... That's why we like Tyler so much. He's just a winner." The only thing different with the new Tyler Johnson is more volume and efficiency. He's averaging career highs in points (15.3), rebounds (4.0) and minutes (30.0) while shooting a scorching 53.5 percent from the field, 50 percent outside and 91.7 percent at the charity stripe. Miami's preseason minutes leader is its only healthy player yet to see regular-season action. Derrick Williams, who started five exhibitions and averaged 9.5 points and 4.6 rebounds over the eight contests, has been the odd man out of the power forward rotation. "A little surprised, but that's the coach's decision," Williams said before Miami's home opener. "I can't really be mad at the fact that I didn't play. I just got to stay ready. That's it." It's the latest disappointing turn for the No. 2 pick, who previously told Bleacher Report he joined the Heat in part because he wanted a "consistent role." The problem seems to be that in his sixth NBA season, Williams still doesn't have a go-to skill. Providing instant offense would be the closest, but he's also a power forward with a career 43.3 field-goal percentage. That doesn't mean he'll be watching from the sidelines forever, though. The two players ahead of him—Luke Babbitt and James Johnson—are shooting a combined 29.4 percent. Miami has struggled to find reserve scoring beyond Tyler Johnson, and this uptempo attack suits Williams perfectly. Consistent floor time could be hard to find, but he deserves a look sooner than later. Bleacher Report: You impressed the Heat in NBA Summer League last year before signing with the Brooklyn Nets. What brought you back here this offseason? Willie Reed: Just the fact of realizing how good this organization was. Being here in summer league, I realized how much better I got in just that short period of time. I thought that the Miami Heat could help take me to the next level, and I could be beneficial to the Heat. B/R: What did the Heat tell you they liked about your game? WR: My motor. They thought I had a really high motor, could protect the rim and play good defense. I think that was the biggest need here, especially when looking for a backup center. I'm just blessed, and I thank God that they gave me the opportunity. B/R: There are a lot of parallels between you and Hassan Whiteside, both in your play styles and long paths to the NBA. What kind of relationship do you have with him, and how much has it helped having him around? WR: Just picking his brain. Obviously, we realize we have similar stories. We talk about it. Seeing how far he's come, it just makes you want to be able to follow in his footsteps. I come in every day and watch what he does and how he works and try to put in the exact same work. Hopefully, I can follow that same path. B/R: I know it's tough to get reflective in the moment, but what does it mean to have an NBA spot after fighting so long to get one? WR: It's a great feeling. I always told myself that I would play in the NBA. How I got here, I didn't know. God has a plan for everybody. My plan wasn't for me to make it to the league until now. Maybe he thought I wasn't ready, but now I have the opportunity to showcase it. I'm just going to follow his word, his path, and everything else will work out for itself. All quotes obtained firsthand. Statistics used courtesy of Basketball Reference.com and NBA.com. Zach Buckley covers the Miami Heat for Bleacher Report. Follow him on Twitter: @ZachBuckleyNBA.